I looked out of my kitchen window this morning and saw a hawk standing on my porch railing, staring intently at something in the grass. What a wonderful surprise! I was afraid that I would scare it away if I dared to step outside, so I decided to take a photo through the back door window. 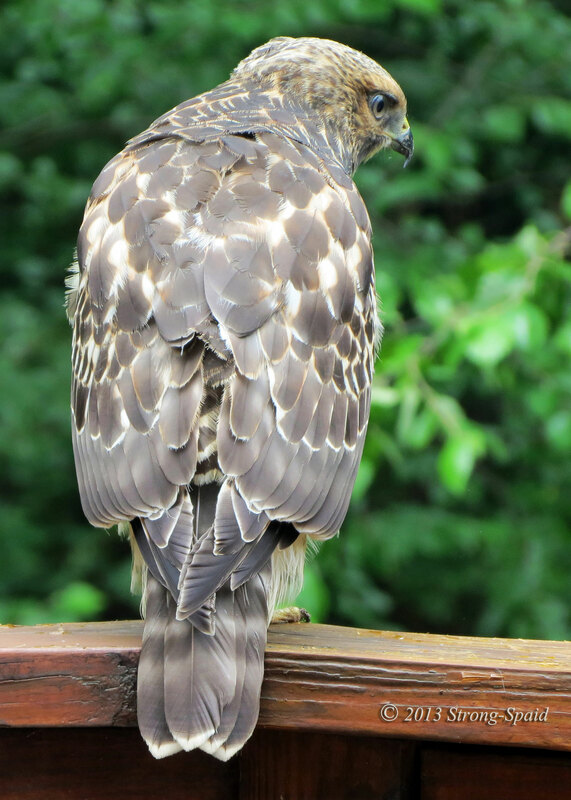 The hawk had its back turned towards me, so I thought it did not notice that I was standing there. But even though I had approached as quietly as I could, my presence was already known. As I was about to take another photo, the hawk turned its head all the way around (without moving its body) and looked straight through my eyes and into my soul. 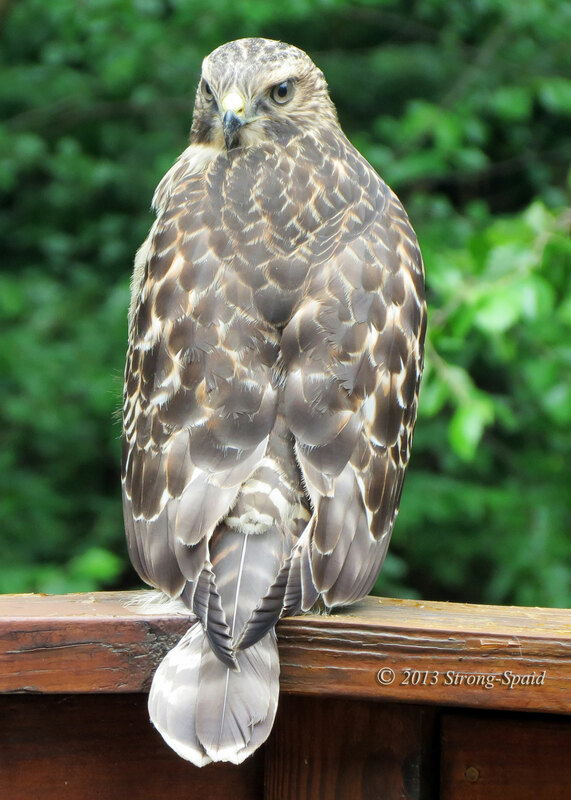 The hawk’s eyes were intense, but somehow beautifully soft and gentle. We stood there looking at each other for a few minutes, neither one of us moving. Not a sound was made, but again and again, I heard the same thought traveling through the air. After a while, it looked down and away from me, as if trying to remember something….. I guess nothing else came to mind, because a few seconds later, it looked up towards the sky and opened its mouth wide as if it was yawning. The hawk then turned its head to the left and gazed off into the distance, giving me the time and opportunity to take a profile shot. Shortly after I took this last photo, without warning, it spread its wings and flew away, up into the nearby oak trees. 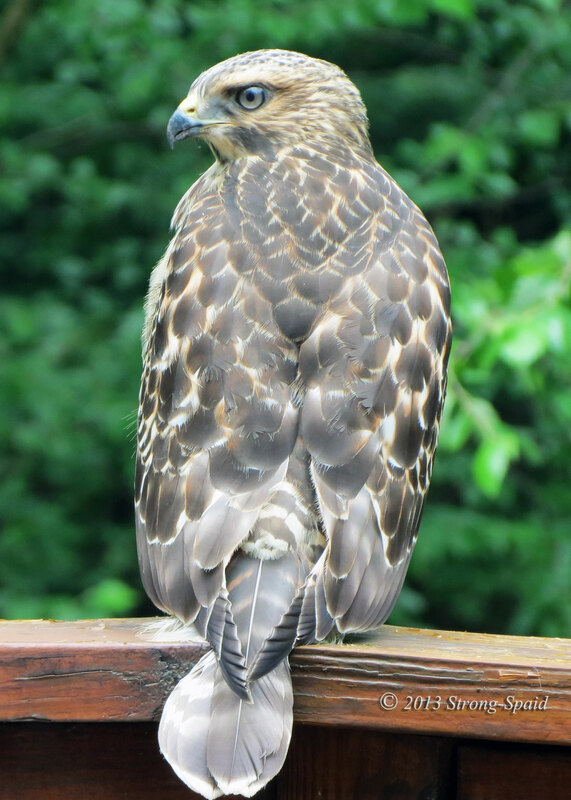 When I opened the back door and walked out onto the porch, I could hear the hawk’s voice calling from above. 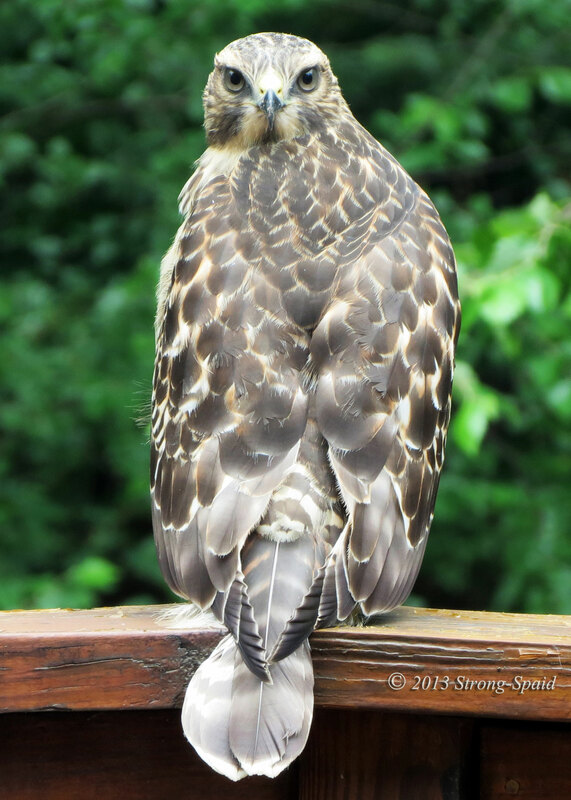 This entry was posted in birds, Nature, Photo Essay, photography, wildlife and tagged Hawk. Bookmark the permalink. How beautiful! And what a wonderful experience that had to have been! And then, for him to come back! Little gifts in life! These images are magnificent. I only wish I could get this close to my red-tailed hawk. I’m not sure but this looks like a Broad-winged Hawk. So beautiful. Thanks for sharing.